Villa Chateaubriand is where Peter Julian Eymard and Raymond de Cuers established the first house of the Blessed Sacrament Congregation in 1856. The house was named after its earlier owner, the influential writer and diplomat François-René de Chateaubriand (1768-1848). It adjoined the Marie-Therese Infirmary (at 92 avenue Denfert-Rochereau), which was established by Chateubriand’s wife in 1819 and was located within almost a hectare of surrounding land and gardens which the Chateaubriands had progressively purchased during their period of ownership. A Chateaubriand commemorative plaque is on the exterior of 92 avenue Denfert-Rochereau. Former chapel entrance, Villa Chateaubriand, Paris. After the large property was acquired by the Archdiocese of Paris in 1838, various religious orders and church organisations were located on the site. The infirmary continued as a residence for retired priests. Villa Chateaubriand was badly neglected when Eymard first occupied the building in mid-1856. In 1879, the original street name rue d’Enfer was changed to avenue Denfert-Rochereau in honour of Colonel Pierre Phillippe Denfert-Rochereau (1823-1878), who had led the successful defence of Belfort in the Franco-Prussian War. The change was a clever pun which retained a sense of the old name while removing its most undesirable aspect (rue d’Enfer meaning ‘lower street’ and open to being corrupted as ‘street of Hell’). Since 1858, 88 avenue Denfert-Rochereau has been occupied by its current owner, L’Institut d’Education Sensorielle (IDES), which continues the original mission of the Blind Sisters of St Paul (established in 1852) to educate young people with visual impairments. 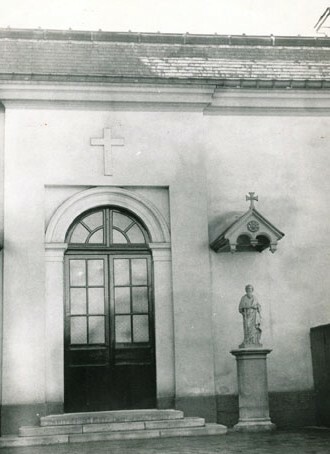 The front sitting room of the building is where the sanctuary of the Blessed Sacrament Congregation chapel was located. Modern buildings were erected on the former Infirmary site from the 1970s. The property was the subject of a heritage dispute in November 2010 when a potential redevelopment threatened the integrity of some of the surrounding parkland and parts of the Infirmary Chapel (where Mme de Chateaubriand is buried). 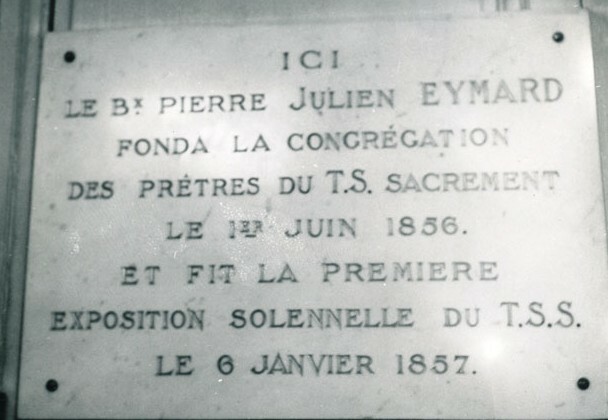 Eymard arrived in Paris on 1 May 1856 with intentions of making a retreat to seek the will of God and, if he still believed it to be God’s will, to approach the Paris bishops for their consent to the establishment of a Society of the Blessed Sacrament. 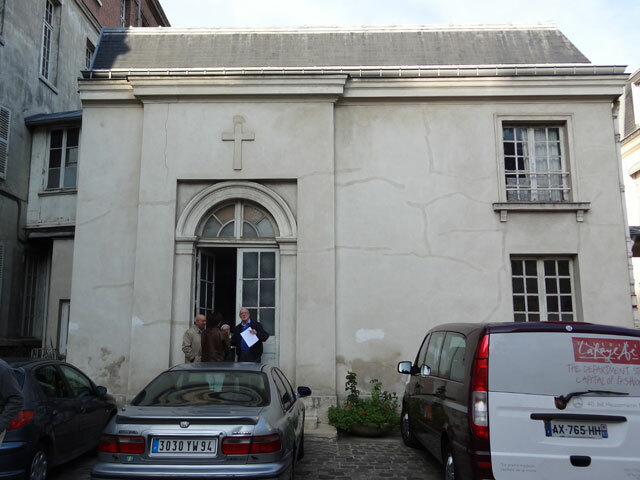 After failing to obtain a room at Mother Dubouché’s community of reparatory adoration (12 rue des Ursulines), he accepted temporary accommodation in the residence of a community of priests dedicated to the Holy Heart of Mary, who were located on part of the diocesan property at 114 rue d’Enfer. I was given a drafty, unheated room; and then another which was very damp. At night my sheets were as damp as if they had just been brought in from the dew; the food was poor. God sustained me. Raymond de Cuers (left) and Peter Julian Eymard. He soon discovered that his rudimentary residence was the Villa Chateaubriand. 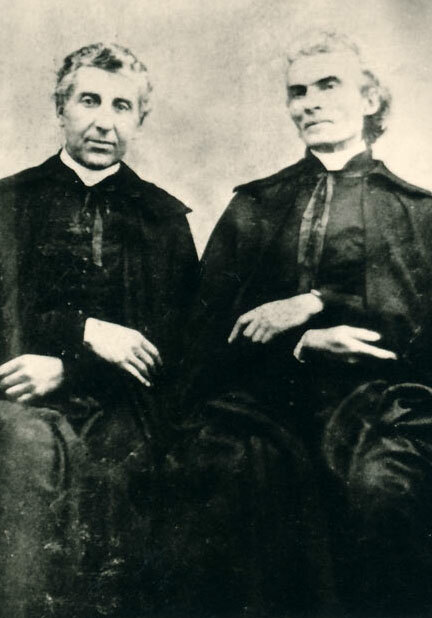 Almost immediately after Eymard had sought and received the consent of the Paris bishops on 13 May 1856, he learned that the community of the Holy Heart of Mary was being disbanded. With the Villa Chateaubriand about to be vacated, the archdiocese offered tenancy of the house to Eymard, who enthusiastically accepted the invitation as another great blessing. A man who came to Paris with only two hundred francs, most of which was already gone, did not have many options. Irrespective of Villa Chateaubriand being barely habitable, Eymard was overjoyed to take official possession of the house on 1 June 1856. Eymard began to call the run-down house the ‘cenacle’, after the upper room in which the Last Supper was held. 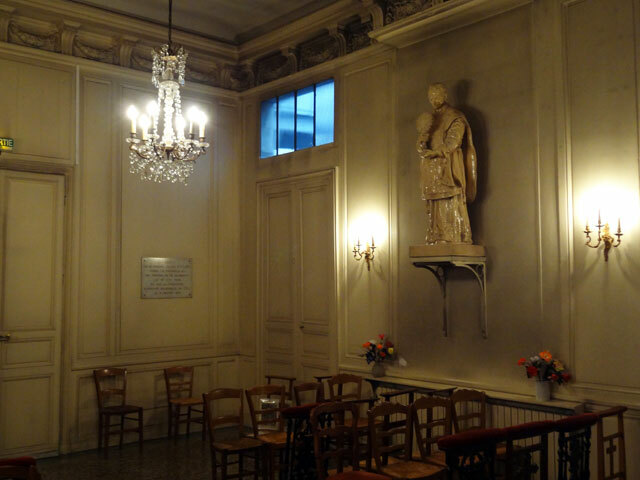 He and his confrere Fr Raymond de Cuers set to work establishing a temporary chapel in Chateaubriand’s former study. Eymard slept in Chateaubriand’s old bedroom, overlooking the parkland and one of the Lebanon cedars that had been planted by the writer decades earlier. The first Mass was celebrated on 2 June 1856, and the Blessed Sacrament was reserved in the tabernacle a fortnight later, on 15 June. With the assistance of the Archdiocese of Paris and generous donations, a larger chapel was built during the summer of 1856 by extending the front of the house. The chapel was consecrated on 28 September 1856 and it was here, on the Feast of the Epiphany, 6 January 1857, that Solemn Exposition of the Blessed Sacrament was inaugurated. The work of the Blessed Sacrament Congregation had begun. By mid-1857 there was adoration on four days and three nights each week. The community had grown by that time to four priests and two brothers, but as 1857 progressed Eymard was left with little more than his faith. Only small numbers of people came to the chapel, and they had little money to give to support the community. The first novice did not stay. Eymard became ill and had to leave for five weeks to recuperate. When he returned, two new priest members of the community had gone. As money ran low, Eymard and De Cuers began selling their books. De Cuers became discouraged and walked out, but returned the following the day. And then there was a disagreement with the Archbishop. Fortunately, this dispute was quickly settled. A much greater problem was that the Archdiocese of Paris decided to put the Villa Chateaubriand on the market. Eymard’s struggling community could not afford to purchase it. On 16 December 1857, the Society of the Blessed Sacrament was given three months’ notice to vacate the premises. Exposition of the Blessed Sacrament at rue d’Enfer ended on 30 March 1858, before Eymard’s pioneer community left rue d’Enfer in the evening on 3 April 1858 (Holy Saturday).